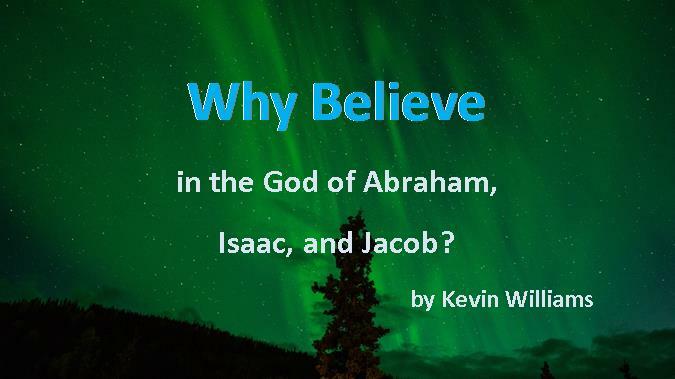 Why believe in the God of Abraham, Isaac, and Jacob? Messianic teacher Kevin Williams offers a compelling reason to trust in God alone. First, I must confess that I believed in God at a very young age. Only the Almighty knows who the two men were who visited my house those many years ago. I came home from the park one summer’s eve to find them talking with my mother about a personal savior who lived, died, and rose again to removed sins and let mankind enter into a personal and eternal relationship with Him. Adults seem to have a difficult time admitting that they do things wrong—that they sin against their Creator. But an 8 or 9 year-old boy knows he does things wrong. He knows because he plots wrong things, because he willingly takes that “triple-dare,” because he often gets caught doing wrong, and because he is often told by his parents, teachers, and authority figures that his behavior is wrong. To a child, being wrong is a part of life. To my young, unclogged mind, the idea of a God who would eliminate all the wrong things—all my sins—was very appealing. So I accepted what they had to say at face value. I didn’t understand all the implications to what I was agreeing to, nor would I for many years to come. But I knew deep down inside that it was the right thing to do and I have never regretted that night’s decision. Many years have passed since that small boy, and I have a pre-school son of my own. Believe it or not, from time to time, I have to tell him in no uncertain terms that he does things that are wrong. One day, I hope and pray that he will place his trust in God’s Messiah as I have. But I am no longer a boy. I no longer think like a lad (though I’m told I act like one on occasion). Many things through the years have challenged me and my faith. Sometimes, blind faith is enough. Other times, faith is the way-station that keeps us safe until introspection and revelation bring us to understanding. So why do I believe in the God of Abraham, Isaac, and Jacob? I could discuss many things: miracles witnessed, prayers answered, and unexplained healings. Not to mention the marvelous work called the Bible and the fact that it was written over a 4,000 year period by people from all variety of backgrounds and cultural experiences. Yet despite this, it has a continuity that mathematically defies the odds. All of those things are important to me, but the overriding incentive is the same reason I had when I was little boy: God is a God of promises. I have no doubt that there are those who, even as they read this, say to themselves, “Yea? Well He never kept any promises to me!” I don’t know your circumstances and I cannot speak to them. What I can speak to are the promises of God to the Hebrew people—the descendants of Abraham, Isaac, and Jacob in the great panorama of time.